Tired of being the person your friends, relatives, and coworkers run to when they’re faced with a Mac problem? Providing help can be gratifying, but repeated requests can be frustrating: once you demonstrate your technical prowess, you quickly become the go-to person whenever someone’s Mac hiccups or burps. That means lots of calls for assistance. You’ll probably never be completely free of some tech-support duties, but with these setup and maintenance tips, you can cut down on “emergency” calls that are hardly urgent. If you think you’re going to spend a lot of time maintaining someone else’s Mac, create an administrator account for yourself. This gives you the power to put things right if necessary, and it lets you set up a limited account for the Mac’s primary user, which can help prevent that person from messing up the computer. OS X 10.4 (Tiger) and OS X 10.5 (Leopard) provide two options for limiting users—standard accounts and managed accounts. Standard accounts: A standard account limits users to creating folders and saving files in certain areas of the Home folder (so they can save files to the Documents folder but not to, say, the root level of the hard drive or the Home folder’s Library folder). Standard users can access programs, but they aren’t allowed to install software or use potentially dangerous preference panes, such as Sharing and Network, both of which require an administrator’s name and password for access. This type of account is particularly good for Windows switchers, who are familiar with computers but may get lost in a new interface. To set up a standard account in Leopard, go to the Accounts preference pane, click on the lock, enter your password, click on the plus-sign (+) button to add a user, and choose Standard from the New Account pop-up menu. In Tiger, any new account you create will be standard by default. Depending on the user’s skill level, you may want to simplify the interface. One way to do that is to remove extraneous items from the Dock. For example, if that person is never going to rock out with Apple’s GarageBand, click and hold on the GarageBand Dock icon and choose Remove From Dock. You can also rearrange the order of Dock items so frequently used applications are on the left, and other programs appear farther down the line. Or you can create aliases of the most-used applications (Control-click on a program icon and select Make Alias) and place them on the desktop. If you fear that a user will accidentally venture into potentially dangerous areas of the startup volume, go to Finder -> Preferences, select the General tab, and disable the ability to view hard disks on the desktop. Likewise, click on the Sidebar tab and disable the Computer, Hard Disks, and External Disks options. Moving these items out of the way makes them harder to stumble upon by accident. Managed accounts: Though generally employed by parents to limit a kid’s Mac usage, managed accounts (accounts that have OS X’s parental controls applied to them) can also be helpful for inexperienced users who need lots of hand-holding. To set up a managed account in Leopard, follow the preceding instructions for creating a new account, but this time choose Managed With Parental Controls from the New Account pop-up menu. Once you’ve created the account, click on the Open Parental Controls button (you can later access these options directly from the Parental Controls preference pane). In Tiger, create a new account, and then click on the Parental Controls tab to enable any of the options, such as Mail or Finder & System. The Simple Finder feature is great for new users because it unclutters the interface and prevents users from touching things that might get them into trouble. For instance, it removes the hard-drive icon from the desktop, simplifies menus, and provides a stripped-down Dock that contains only the Trash and three folders—My Applications, Documents, and Shared. 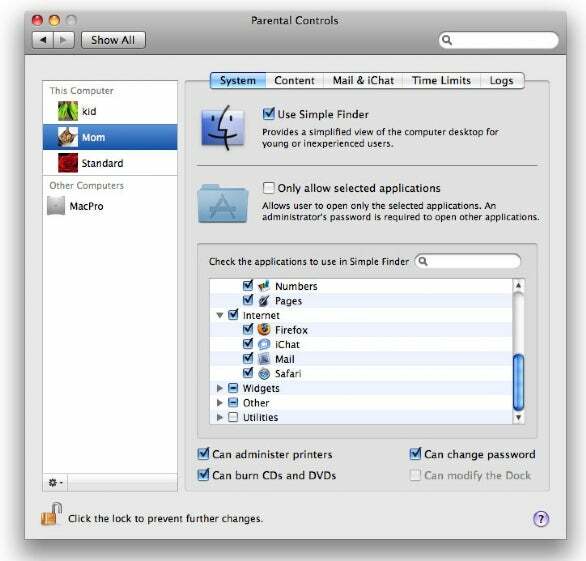 To enable the Simple Finder in Leopard, go to the Parental Controls preference pane’s System tab. In Tiger, open the Accounts preference pane, click on the Parental Controls tab, and then select the Configure button next to the Finder & System entry. You can also choose which applications a person is allowed to use. In Leopard, you access these controls at the bottom of the System tab. In Tiger, you’ll find similar options in the same window you used to enable the Simple Finder. If you’re creating this account for an adult, you needn’t worry about filtering content, mail, and chat identities, or creating time limits. For more information on parental controls, see “Leopard's parental controls”. Use OS X's parental controls to simplify a Mac for any new user, not just a child. Many new Mac users buy computers primarily to surf the Web and check e-mail. This can lead to late-night calls that start with “I can’t get onto the Internet!” or “My e-mail’s not working!” Here are steps you can take to keep these calls at bay. Tweak Mail: E-mail problems and questions are inevitable. But if you carefully configure Apple’s Mail, you may save yourself some troubleshooting work down the line. It’s easy to configure a Gmail account in Leopard’s Mail. Just choose File -> Add Account, and then enter the person’s name, Gmail address, and password in the Add Account window. With the Automatically Set Up Account option enabled, Mail will fill in the POP and SMTP server settings for you. To help prevent junk e-mail from overwhelming the user and to ensure that junk mail is moved to its own Junk folder, open Mail -> Preferences, click on the Junk Mail tab, select the Enable Junk Mail Filtering option, and then select the Move It To The Junk Mailbox option. Make sure the Filter Junk Mail Before Applying My Rules option is also selected. So take screenshots of important windows (Command-Shift-3). I find it easiest to print out one copy for the person I’m helping and another for myself. (I stick mine on my bulletin board so I can find it quickly.) You might prefer to keep an electronic record for yourself. In Leopard, navigate to the Network preference pane, select the computer’s connection type (Ethernet or AirPort, for example), and take a screenshot. Click on the Advanced button, go to the TCP/IP tab, and take another screenshot. In Tiger, opening the Network preference pane should reveal a window that reflects the current Internet connection’s TCP/IP settings. You should also take screenshots of the user’s e-mail settings, which you can find under the Accounts tab of Mail’s Preferences window. Deal with passwords: Between banking, bills, e-commerce, and social networking sites, Web users have to create and recall an increasing number of passwords. To help new users navigate the Internet more smoothly, devise a system for storing and retrieving passwords. It’s a good idea to write down e-mail, iTunes, and emergency administrator passwords and tuck them away in a secret spot in the user’s home. For Web passwords, Safari will save some login names and passwords in a keychain if you tell it to, but it won’t always prompt you to save them. Instead, consider Agile Web Solutions’ $40 1Password ( ), an invaluable and easy-to-use tool that allows you to save and retrieve passwords as well as auto-fill credit card information. Sign up with AIM: AIM is AOL’s free iChat-compatible service. Go to the AIM Web site and register Norbert for an account. Add AIM account to iChat: Launch iChat—this should bring up an Account Setup window. Choose AIM Account from the Account Type pop-up menu, and then enter the screen name and password in the appropriate fields. Click on Done. Add yourself as a buddy: In iChat, choose Buddies -> Add Buddy; in the sheet that appears, enter your AIM or MobileMe account name, as well as your first and last name. 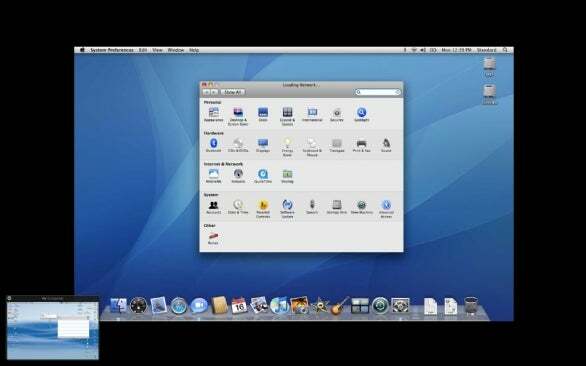 Turn on screen sharing: In iChat, choose Video -> Screen Sharing Enabled. It’s not necessary to turn on screen sharing in the Sharing preference pane if you’re viewing this Mac’s screen via iChat. Use iChat's screen-sharing interface to troubleshoot remotely. Here we see a remote user's Mac (with our Mac's screen in the bottom-left corner). Add the buddy to your iChat: On your Mac, add Cousin Norbert as a buddy (using the previously described process). Start sharing: The next time Norbert has a problem, ask him to launch iChat and wait for your request to share his screen. To send that request, select Norbert’s screen name in your iChat Buddy list, click on the Start Screen Sharing button at the bottom of the window (the overlapping screen icon), and select Ask to Share nameofuser’s Screen. When the request appears on Norbert’s screen, tell him to click on the window and then on the Accept button. His screen should now show up on your computer; tell him to let go of the mouse so you can take control of his machine and try to resolve the problem. Senior Editor Christopher Breen’s friends and relatives always thank him when he helps them with their computing problems.